How would you react to a writer who names her books Grotesque and Out? I read the latter some time ago and found it so fascinating, I readily picked up Real World, (by Natsuo Kirino of Tokyo) when I found it on the New Releases shelf at the library. Out portrayed the lives of a group of women harassed at work and/or at home in a male dominated society. They support each other through thick and thin in an "unholy" alliance of women. They get even, as I remember it, and cover for one another. This new book, Real World, is about four teenage girls who suspect a local boy of committing a murder and are curious enough about him that they go out of their way to befriend him. Two are bored with their humdrum lives and want to be part of a new "adventure," so they befriend the boy, helping him in his escape. This in spite of the fact that the murder is of his own mother. One of the girls gives him her bike and a new cell phone. Another takes the train to join him for a time while he runs from the authorities, paying for a cheap hotel where he can take a bath and get some sleep. A third is coerced into writing a "story or poem" of confession for him, which he wants to carry around in case he is ever caught by the police and has to answer to them. They all carry on conversations with the boy by cell phone. The boy fantasizes that he is the Japanese soldier he saw in a film in grade school, a soldier being beaten and stabbed by an old Filipino woman and a man, evidently as a revenge for the Japanese occupation during WWII. This image seems to haunt him, and he sees his own demanding and nagging mother as the Filipino woman. The four teenage girls who are curious about the boy and the 17 year old boy himself try to escape the reality of their lives, humdrum or horrific. They feel that what people see on the outside is different from what they are. Real World is another noir novel by Kirino, this time about teens facing the consequences of the decisions they make. ***** Five stars for this novel! Kathi Harris's Medusa: The Beginning is a sci-fi novel published in 2007. It describes the rise of an African-American to the presidency of the United States in the middle of troubled times. "Many of you have already accepted the fact that I am African American and realize my color makes no difference in my ability to lead or to inspire..."
The preceding is an excerpt from the novel, part of the president's acceptance speech. YOUR VIEWS: Does Obama's win change people's perception of race? A Guide to the Birds of East Africa by Nicholas Drayson is a clever way to write about Kenya and politics and its expatriates, British and Indian. 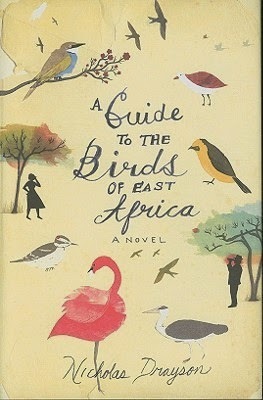 In spite of the title, A Guide to the Birds of East Africa is actually a novel, with sketches and the names of dozens of birds in Kenya. The story centers around a widower, Mr. Malik, who owns his own business but takes time off weekly to visit AIDS patients in a hospital and to attend the Tuesday bird walks led by a widow, Rose Mbikwa. Mr. Malik wants to ask Rose to the Nairobi Hunt Club Ball, but when another member of the Asadi Club, Harry Khan, expresses his interest in the lady as well, the club members decide the two men should have a competition to determine who should ask Rose to the ball. The competition involves bird watching and making a list of the different species of birds they see within a set period of time. The winner will be the one that sees the most birds of different species. While Harry enlists the help of two Australian birders and hops on planes to fly remote parts of Kenya that have the most unusual birds, Malik remains close to his business and counts birds in his garden, at the Botanical Garden and the arboretum in the city, and the area around the sewage plant. He does make a car trip away from the city, to the home of a young man in his employ, which adds a lot to his list of bird sightings. For Malik, the competition is more eventful than for Harry. Malik's car is stolen at the arboretum, and after he recovers it, he is waylaid in the bush by two Somalis intent on capturing his young employee Benjamin for conscription into their army. Malik escapes by leaving his car and hiding in a cave. One more worry for Malik - the notebook in his stolen car. Not only does it have the list of birds he has seen, it also has compromising notes on the political characters he satirizes weekly in a newspaper column - which he writes anonymously. Harry also his share of adventure - he is arrested by soldiers while birding at night too close to a military compound. In the end, does it all work our for Malik, the book's obvious hero? Does he win the competition, stay out of jail? The book has been sold, evidently, in eight countries. I enjoyed reading it.